Beware of Ballot Falloff/Ballot Fatigue—Important Choices at End! The farther down the ballot an office is, the fewer the number of votes that will be cast for it. This is called “ballot fatigue. NC’s 2018 general election, the ballot is 2 pages long (the ones I have seen, anyway). It is common for people who go to the polls not to vote for every contested position or proposed initiative. The difference between how many people go to the polls and how many actually vote on a specific issue or candidate is called voter falloff. For example, if a million voters cast ballots for president, but only 200,000 are cast for supreme court justice, then the falloff is 800,000 or 80%. The level of falloff varies from race to race and issue to issue. Falloff happens for a variety of reasons. It can take a while to research choices sufficiently. Some people may feel uninformed about choices and skip down to candidates or issues they know. Endorsements from organizations you trust are helpful. NC NOW PAC has been providing endorsements in statewide races for decades. There is another phenomenon, called midterm falloff. Voters generally participate less in midterm elections than in presidential elections. “There are categories of voters—notably young and minority (especially Latino and Asian-American, and to a lesser extent African-American) voters—who regularly become a smaller percentage of the electorate in midterms.” “There is also a very real risk that Millennial turnout could lag in 2018,” according to “Democratic Wave may Depend on Millennials Becoming Unusually Motivated to Vote,” 5/17/18. Another important factor in close races is position of a candidate on ballot. Studies have shown ballot order favors the candidate listed first. NC lawmakers passed a law in June 2018 that puts NC Supreme Court candidate Anita Earls last on the ballot. The #NCGA also put all of the judicial races after other partisan races. Earls would have been first. The fact that judicial candidates have partisan tags at all is new in 2018. The NC Legislature passed a bill in March 2017, which was vetoed by Governor Roy Cooper. The NC Legislature then overrode Cooper’s veto, also in March 2017. 2018 is the first time NC has had partisan judicial elections since 1998 for superior court judges, and since 2002 for district court judges. Governor McCrory had signed bills making Appellate court races and NC Court of Appeals races partisan. They had both been non-partisan since 2004. 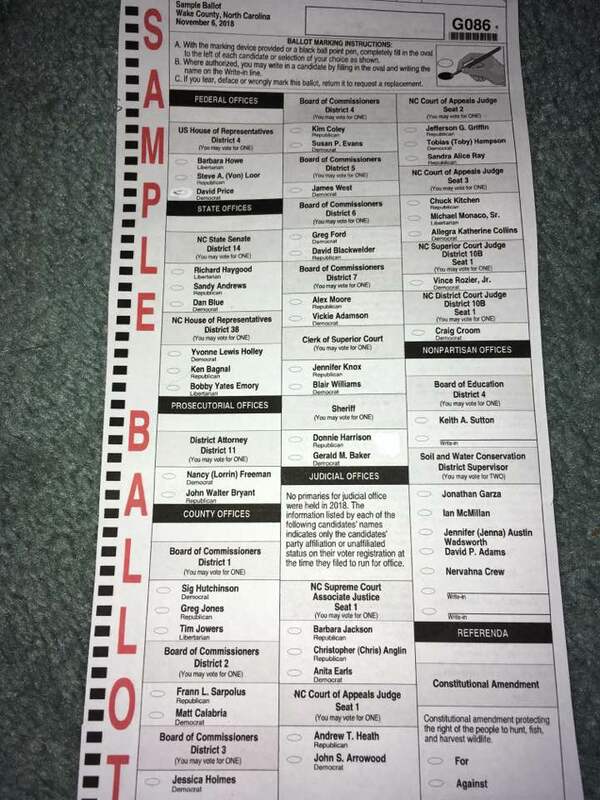 One way to prevent ballot falloff is to be prepared. This post tells North Carolinians how to find their sample ballot, polling history, polling location for election day, and more. Check with counties to find early voting sites and hours. This entry was posted in constitutional amendment, Courts, voter suppression, voting and tagged constitutional amendment, Courts, voting. Bookmark the permalink.